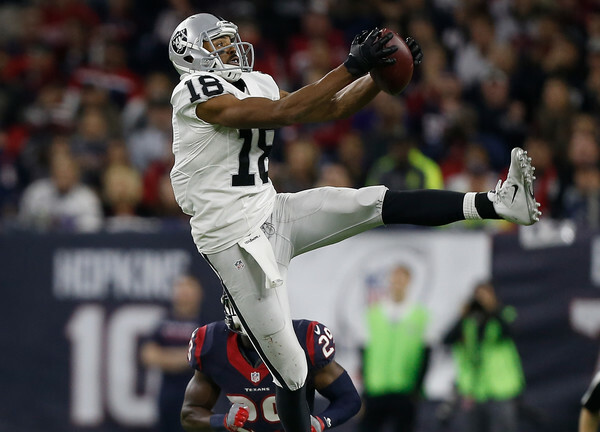 Despite not having a very productive season, Andre Holmes seems to be getting plenty of attention around the league. The Oakland Raiders want to retain him, while the Washington Redskins, San Francisco 49ers, Detroit Lions, Chicago Bears and New York Jets are all looking into the option of signing him. Holmes has a planned visit with the Lions on Sunday, which could mean his free agency won’t be very long and won’t include a visit to each of the teams that have him on the shortlist. The Lions have been linked to a number of pass catchers, and Holmes might be more of a general interest as they try to see who fits their plans best. Holmes is a five-year veteran, who went undrafted before joining the Dallas Cowboys (played college football for Hillsdale). He signed with the Raiders in 2013, and had a pretty productive 2014, which included 693 yards and 4 touchdowns, but has since seen less and less of the ball in the Raiders offense. He has started in just 3 games over the last two seasons (Appearing in all 16 games over the last 3), finishing with 126 yards and 3 touchdowns in 2016. He did have a touchdown reception in the Raiders playoff game this season, and his 6’5 frame and ability to catch the ball in the end zone in limited opportunities, along with a team-friendly price tag, helps explain why he’s in such high demand. He was a one-year, $2 million deal last season with Oakland. He’ll probably see a raise and maybe even a non-guaranteed two-year deal (Holmes is 28), but he’s not going to be too much of an expenditure for anyone that signs him. In conclusion, Holmes is a good option for a team looking to add a big receiver who can haul it down for a few touchdowns a year, and doesn’t mind being the #3 guy or even worse on the depth chart. Holmes fits that bill, plus he’s healthy and makes the most of few opportunities, making him a terrific asset, even for contenders.